Painter, sculptor, architect, engineer, pioneer of flight, anatomist, scientist - yet according to Vasari, Leonardo’s first job outside Florence was as a musician. 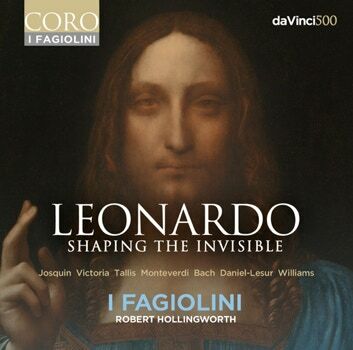 “Music cannot be regarded other than as the sister of painting", said Leonardo, so for the 500th anniversary of his death in 2019, I Fagiolini and Martin Kemp offer reflections of his images in vocal music: aural fantasia dei vinci - art through the prism of music, in works by Tallis, Victoria, Monteverdi, Bach, Howells and Daniel-Lesur. The title track ‘Shaping the invisible’ (Leonardo’s phrase) is a new commission by Adrian Williams and poet Gillian Clarke for eight voices, celebrating Leonardo’s scientific investigation and obsession with flight. Professor Martin Kemp previews a selection of tracks from &apos;Leonardo - Shaping the invisible&apos; as part of the launch of the National Gallery Da Vinci celebrations.